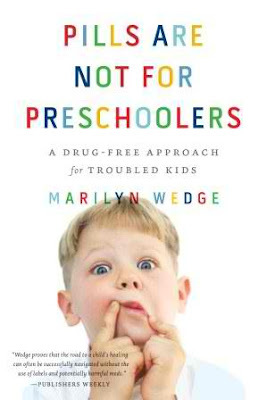 When I first read the title of the book I'd be reading, Pills are not for Preschoolers - A Drug Free Approach for Troubled Kids, by Marilyn Wedge, I assumed that it would be focused on the preschool age group. But the title is slightly misleading, because the book actually approaches all the age groups, from toddlers to kids just leaving the home. If you've been following my blog for a while, you know I like to be conservative with medications in general, particularly in children. Having worked with juvenile delinquents for a number of years (and visited many a residential treatment facility), I was curious to read more about Wedge's treatment approach. Wedge is a family systems therapist, and as such views the symptoms a child has not as a psychiatric disorder, but rather as a sign that something is wrong in the family. She feels that the family can be fixed through therapeutic intervention, after which the child will stop displaying so many symptoms. Now this isn't to say that she blames the family or the parents - not at all! Just that there are areas which may be causing concerns that need to be healed. In addition, family therapists may meet with siblings and even extended family, teachers, and other involved people. The thing I loved most about this book was reading all of the case studies. Many of them reminded me of teens that I worked with myself. It gave me pause to wonder if they might have responded in a different way had the family seen a family systems therapist, who would have aimed at changing the system that the child was a part of (i.e. the family) and subsequently producing a positive change in the child's feelings and behavior. According to Wedge's book, often a behavior is a way of protecting a parent in some way, so when issues in the parent's life are addressed, the child's behavior will improve. Of course, the key to this sort of therapy is that the parents must be actively involved or it just won't work. In addition, if the underlying family issues are not addressed, another family member may later develop symptoms. I often saw children who didn't respond well to intervention, whose parents seemed to sabotage my efforts. And later, we'd see younger siblings come through the court system too. It can be a vicious cycle. The other consideration is that the therapist needs to have a really strong relationship with the patient. It can be tricky to find the right therapist, but Wedge does offer some guidelines at the end of her book. Overall, I really enjoyed reading this. So much, that I devoured it in two days. All of the case studies of the children Wedge has worked with really make this an interesting book. I also think the tips inside would be helpful to many parents. And if you have a child that has some behavior problems, it would be a must-read prior to considering medication. Having the background that I do, I feel that there are some (limited) times when medication is warranted in children, but I also think that kids are significantly overmedicated, and that parents should empower themselves by doing research prior to filling a prescription for their child. If you'd like to know more, you can visit Marilyn Wedge's website. She has a PhD from the University of Chicago and has more than twenty years of experience working with children, adolescents, and families. She is a family therapist in private practice in Westlake Village, California. Disclaimer: I received a copy of this book for review purposes. The opinions stated above are my own. I participated in this review through TLC Book Tours. It sounds like a great idea to start them young in learning about drugs. It sounds like a good book. I have to say I do not understand parents rush to medicate their children these days. I will pass this on to my wife, she works with some of the special needs kids in school and sees all kinds of stuff. I would feel better about the whole drug thing if there was a test to show the actual levels of chemicals that are supposed to be out of balance. That way they could say oh we need to raise this level. Now I get the feeling it is theory and guessing and drug companies making a quarterly profit. pictures for him. That's when we learned my son has a high IQ. This doctor built a good relationship with my son and he was very helpful during such a difficult time. A lot of children don't get the extra help they may need, so many don't even get what they need from their own parents...very sad. Thank you Lisa for taking the time to read and review my book. I am happy you enjoyed it and found it helpful. To respond to the above comment, there are no laboratory tests for mental disorders. Medical scientists have no idea what so-called chemicals are involved or how they are "out of balance." Unfortunately, the chemical imbalance theory is a myth created by drug companies and doctors on their payroll in order to sell more psychotropic drugs to children. Wow thats interesting ! Have a great weekend! I so agree! There is just no way so many kids can have ADHD. Stopping by to wish you and your family a nice weekend, Lisa. Thx for the book review. I know my sis would enjoy this one for her grands. Well-written and thoughtful review, Lisa. I liked how you added some of your own experiences in the work you've done. OH how I hope and pray that more parents of children will read this book... I cannot believe the number of children on medications these days. Parents are NOT discipling their children these days --so they get meds instead... GADS---what has happened to some good ole common discipline???????? Great review, Lisa. Can you lend this one out? It might be useful information as I will someday get back into the classroom! Lisa great review and a very interesting subject. I have seen a lot of troubled children in my life for various reasons and I thin the quick fix drug is not the way to go. I was a child that would have been put on something for ADHD now a days. I was a bright child who when bored would not listen nor do what was expected. I think there are a lot of children who are creatively different and have family issues that need to be addressed not medicated first. That is some very good information in that book! Those statistics are quite scary. This sounds like an excellent read for our over medicated society! Thanks for taking the time to read and review this one for the tour! I think this is a must have book for all parents. Sounds like a book I need to share with my children and their growing families. This evening while I was at Ben's house he got me his favorite book to read. Do you remember the Halloween book that you sent me in one of your give aways? Ben just loves this book and we read it year around..
Have a great week=end.. ta ta for now from Iowa~! This sounds like an interesting subject- I think society is to quick to put kids on medication instead of addressing the issues at hand. Sounds really wonderful. I'm glad you got the chance to read it! I try to not medicate my kids. They get a daily vitamin. They have allergies like I do. We try and treat that with the neti pot. Luckily they will do that. It helps so much! I'm speechless that kids as young as 2 years old would be prescribed psychotropic drugs. Yikes! I think as a country we turn far too quickly to the quick fix, so I think books like this are very important in spreading the word about other options. I am so with you on the cautious approach to any drug treatments. I am definitely putting this book on my to read list! this is a book i need to read -- i have SO many students that have severe issues and unstable family lives -- it's so hard and frustrating without family support (or limited/inconsistent family support). thanks for sharing. I like the way you pulled out the statistics. Peggy Orenstein's Cinderella Ate My Daughter (another of my favourite parenting books, this one has just joined that short list) has a snappy little appendix with a list of shocking facts...that would have made a handy addition to this work too.